Dreaming of summer of in these parts! It's supposed to snow some more tonight....up to 4 more inches! Yippee......not! Spotted this bag a couple weeks ago and can already picture wearing it billions different ways. Farmers Market, check! Beach, check! Summer vacations, check! On my bike (with the straps adjusted short), check! Do you have a great summer bag? I dont really have any great bags...my life is so sad. Haha. That's a really cute bag...however seems a bit pricey for that material. Apparently it's not though since it's sold out! I'm obsessed with the cobalt purses right now and think they'd be great for summer. I have a cute "straw" (I use that word loosely...sounds cheap) bag from Roxy that I bought last summer. And gold shoes...need a pair of those for spring/summer too.! 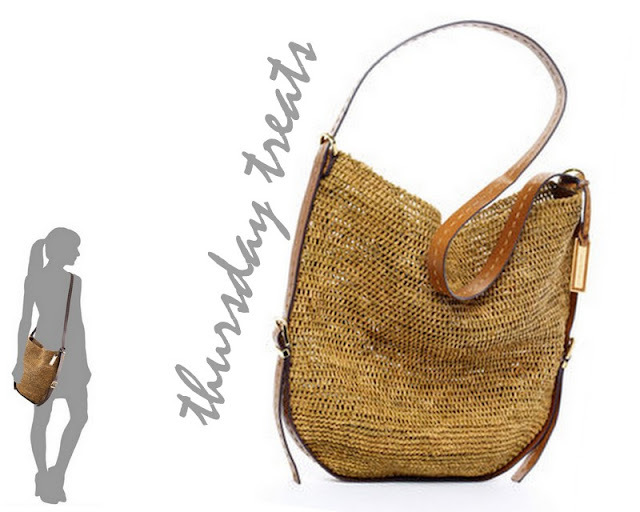 That is a PERFECT spring/summer bag...Love!